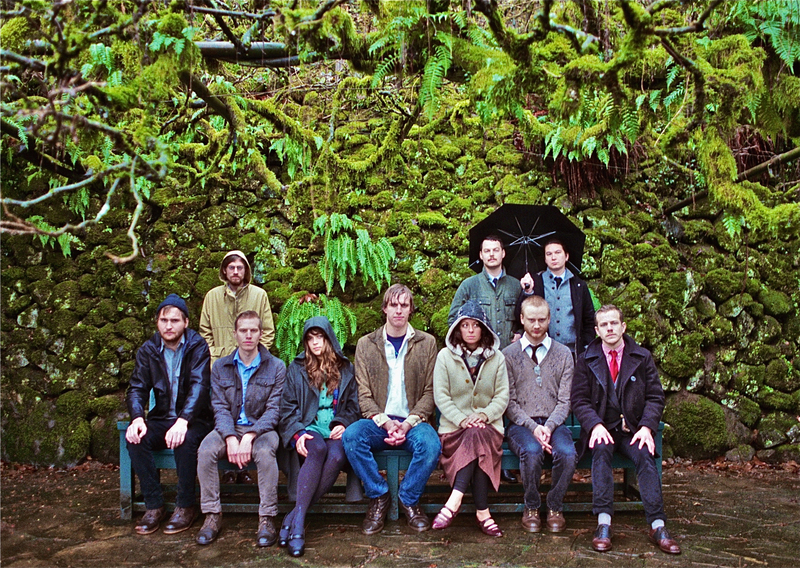 Portland's TYPHOON plays on the Harbor Stage at 12:35 PM. Festavarians hate making decisions…especially the difficult ones. I’ve done some of the heavy lifting for you. 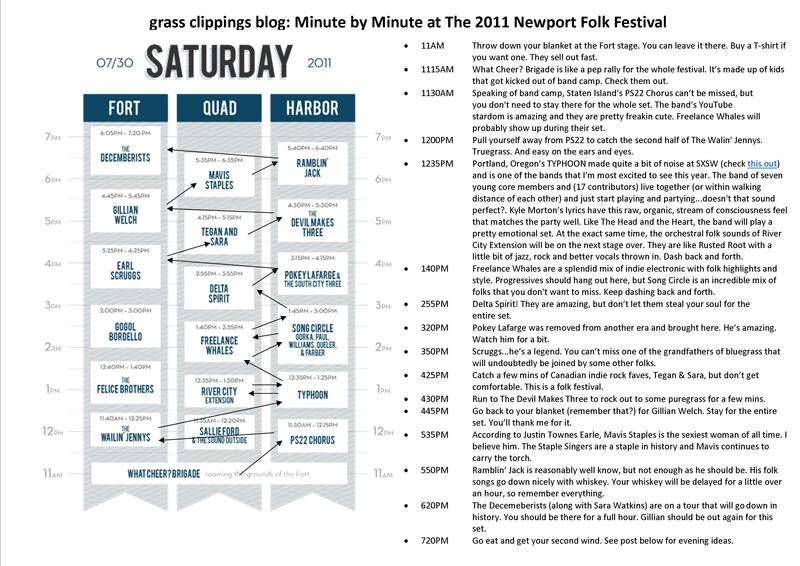 Here’s a recommended minute-by-minute plan for Saturday at the Newport Folk Festival. Note that this was VERY hard to do and I would pay damn good money for seeing pretty much every band at the festival that didn’t make my picks. 11AM – Throw down your blanket at the Fort stage. You can leave it there, but remember your fellow festavarians. Buy a T-shirt if you want one. They sell out fast. Also, get your beer braclet and tickets ASAP. The line gets long. 1115AM – What Cheer? Brigade is like a pep rally for the whole festival. It’s made up of kids that got kicked out of band camp. Check them out. 1130AM – Speaking of band camp…Staten Island’s PS22 Chorus can’t be missed, but you don’t need to stay there for the whole set. The band’s YouTube stardom is amazing and they are pretty freakin cute. Freelance Whales will probably show up during their set. 1200PM – Pull yourself away from PS22 to catch the second half of The Walin’ Jennys. Truegrass. And easy on the ears and eyes. 1235PM – Portland, Oregon’s TYPHOON made quite a bit of noise at SXSW (check this out) and is one of the bands that I’m most excited to see this year. The band of seven young core members and (17 contributors) live together (or within walking distance of each other) and just start playing and partying…doesn’t that sound perfect?. Kyle Morton’s lyrics have this raw, organic, stream of consciousness feel that matches the party well. Like The Head and the Heart, the band will play a pretty emotional set. At the exact same time, the orchestral folk sounds of River City Extension will be on the next stage over. They are like Rusted Root with a little bit of jazz, rock and better vocals thrown in. Dash back and forth. 140PM – Freelance Whales are a splendid mix of indie electronic with folk highlights and style. Progressives should hang out here, but Song Circle is an incredible mix of folks that you don’t want to miss. Keep dashing back and forth. 255PM – Delta Spirit! They are amazing, but don’t let them steal your soul for the entire set. 320PM – Pokey Lafarge was removed from another era and brought here. He’s amazing. Watch him for a bit. 350PM – Scruggs…he’s a legend. You can’t miss one of the grandfathers of bluegrass that will undoubtedly be joined by some other folks. comfortable. This is a folk festival. 430PM – Run to The Devil Makes Three to rock out to some puregrass for a few mins. 445PM – Go back to your blanket (remember that?) for Gillian Welch. Stay for the entire set. You’ll thank me for it. Ohh, this is a good time to get a Magic Hat. 535PM – According to Justin Townes Earle, Mavis Staples is the sexiest woman of all time. I believe him. The Staple Singers are a staple in history and Mavis continues to carry the torch of the family. 550PM – Ramblin’ Jack is reasonably well know, but not enough as he should be. His folk songs go down nicely with whiskey. Your whiskey will be delayed for a little over an hour, so remember everything. 620PM – The Decemeberists (along with Sara Watkins) are on a tour that will go down in history. You should be there for a full hour. Gillian should be out again for this set. 720PM – Go eat and get your second wind. See post below for evening ideas. Stay tuned to grass clippings for our Sunday plan. Print a PDF of Saturday’s guide here. And don’t forget to come say hey to the team.